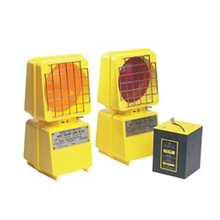 THE HL-95 HAZARD LAMP IS A SEMI-PORTABLE, FREE STANDING ILLUMINATED WARNING DEVICE FOR USE IN ZONES 0, 1 OR 2 HAZARDOUS AREAS. 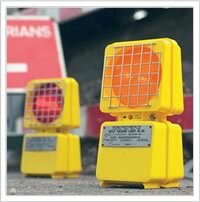 COMPLIANT WITH THE ATEX EQUIPMENT DIRECTIVE AND APPROVED TO THE EUROPEAN EN50 RANGE OF STANDARDS CONCERNING ‘ELECTRICAL APPARATUS FOR POTENTIALLY EXPLOSIVE ATMOSPHERES’, IT IS UNIQUE AMONGST PORTABLE ‘EX’ LIGHTING EQUIPMENT. The HL-95 is powered by an air-depolarised primary cell battery, which has an exceptionally high capacity from a relatively small, light weight package size. A single battery, used in the flashing light output mode, provides continuous duration for up to 1500 hours, or two months. In static mode where the lamp is continuously lit, the duration will be up to 500 hours. Operation of the lamp and selection of flashing or static mode is made from a single three position toggle switch mounted on the outside of the lamp. A further extension to battery duration can be achieved by selecting ‘daylight cut-out mode’ via the internally mounted selection switch. If the lamp is being used outdoors a light dependant resistor will detect when darkness falls and accordingly activate the lamp. Equally, when light levels increase, it automatically switch off, conserving battery energy. It is estimated that a lamp set to flashing and in daylight cut-out mode could operate for up to six months from a single battery. The HL-95 has two lenses positioned ‘back to back’. The light output from these lenses is greater than 2cd and thereby meets the requirements of BS 3143: part 2, Road danger lamps, for a bi-directional hazard lamp. Light is provided by a pair of ‘everlasting’ light emitting diodes. The use of such solid state devices allows the lamp to be sited in zone 0, 1 or 2 hazardous areas. The light emitting diodes are coloured amber and are positioned behind a transparent plastic lens. The lens is protected from damage by a stainless steel guard fitted directly to the impact resistant polypropylene lamp body.